The National Hockey League season resumes today with 14 games on the schedule after an off-day yesterday for U.S. Thanksgiving. We’re coming off a 3-1 night on Wednesday to get back up to +5 units on the season. Hoping to build on that momentum on a busy Friday as well as 11 more games to come tomorrow night. One of our bets already started (we posted the Penguins/Bruins Under 5.5 on Twitter and Facebook), but we’ve got 2 more bets in afternoon action plus another pair of wagers on contests scheduled for tonight. You can see them below, followed by the usual breakdowns and opinions on every other game. Good luck today and enjoy all the action! Reasons to bet Pittsburgh: The Penguins normally bounce back well after bad losses, winning 6 of their last 8 following a loss of 3+ goals at home. Boston has scored 2 regulation time goals or less in 6 of its last 7 games and 8 of 10. Reasons to bet Boston: The Bruins have beaten Pittsburgh in 12 of the last 16 meetings overall and 7 of the last 8 in Boston. The Penguins are just 5-7-2 on the road. Reasons to bet Colorado: The Avalanche has won 3 of its last 4 games and is 6-3-1 in its last 10. Minnesota has allowed 4+ goals in 3 of its last 4 games and 5 of 9. Reasons to bet Minnesota: The Wild is 9-2 in its last 11 home games against Colorado and 13-4 in the last 17 meetings. Colorado has allowed 3+ goals in 7 of its last 8 road games. Reasons to bet New York: The Islanders beat Philadelphia 4-3 in overtime Wednesday in New York. Philadelphia has lost 6 straight overall and 6 of 7 at home. Reasons to bet Philadelphia: The Flyers have won 6 of the last 8 meetings and 20 of their last 26 home games versus New York. The Islanders have allowed 3+ goals in 8 of their last 10 games. Reasons to bet Nashville: The Predators have won 8 of their last 9 games, scoring 3+ goals in all of those outings. St. Louis has allowed 3+ goals in 4 of its last 5. Reasons to bet St. Louis: The Blues get their first chance to avenge a 6-game loss to Nashville in last year’s playoffs. St. Louis is 8-2 at home while the Predators are 5-5-1 on the road. Reasons to bet Calgary: The Flames are 7-2-1 in their last 10 games and 6-3-1 on the road. Dallas has given up 3+ goals in 5 of its last 6 games and is playing its 3rd game in 4 days. Reasons to bet Dallas: The Stars are 8-1 in their last 9 home games. Calgary is playing its fifth consecutive road game. Reasons to bet Winnipeg: The Jets have lost in regulation time just twice in their last 15 games. Anaheim was outshot 49-19 in a 4-2 loss at home to Vegas on Wednesday and is playing its 4th game in 6 days. Reasons to bet Anaheim: The Ducks have dominated Winnipeg lately, going 13-1-2 in the last 16 meetings and 6-0-1 in the last 7 in Anaheim. Reasons to bet Tampa: The Lightning is 7-1-1 on the road this season and is also 7-1-1 in its last 9 overall. Washington has given up 4+ goals in 3 of its last 5 games. Reasons to bet Washington: The Capitals have won 5 of their last 6 home games, allowing 7 goals in those 5 victories. Tampa has lost 7 of the last 9 meetings, and 21 of 27 in Washington. Reasons to bet San Jose: The Sharks are 5-2 on the road and have held 8 of their last 10 overall opponents to 2 regulation time goals or less. Reasons to bet Vegas: The Golden Knights have outshot their last 3 opponents by a margin of 119-69. The Sharks have been limited to 2 goals or less in 6 of their last 8 games. Reasons to bet Vancouver: The Canucks won 5-2 Wednesday in Pittsburgh, their 7th victory in their last 8 road games. New Jersey has 2 regulation time wins in its last 10. Reasons to bet New Jersey: The Devils have won 6 straight meetings between the teams. Vancouver has allowed at least 2 goals in 10 straight games and 3+ in 6 of 9. Reasons to bet Edmonton: The Oilers scored 6 goals Wednesday in Detroit, the fourth time in 5 games that they’ve scored at least 3 times. Buffalo has lost 7 straight and is 2-7-1 at home. Reasons to bet Buffalo: The Sabres have scored 6 goals in their last 4 periods after scoring 1 goal in 5 of their previous 7 games. Edmonton has lost 8 of its last 9 games following a victory and has 2 regulation time wins in its last 10. Reasons to bet Ottawa: The Senators have won 5 of their last 6 visits to the Blue Jackets and are 4-2-1 on the road. Columbus has scored 9 regulation time goals in its last 7 games. Reasons to bet Columbus: The Blue Jackets have won 5 straight games, allowing 4 goals during the streak. The Senators have lost 4 straight and been outscored 14-5 since playing 2 games in Sweden. Reasons to bet Detroit: The Red Wings have scored 3+ goals in 6 of their last 8 games and are 6-6 on the road. Reasons to bet New York: The Rangers whipped Carolina 6-1 Wednesday in Carolina, their eighth win in their last 10 games. Detroit has lost 6 of its last 7 games in New York. 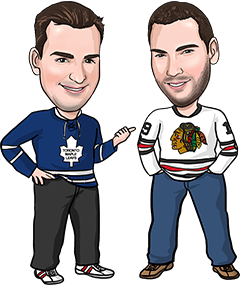 Reasons to bet Toronto: The Leafs have allowed 2 regulation time goals in their last 3 road games and 2 or less in 6 of their last 7. Carolina has won just 4 of its 10 home games this year (4-3-3). Reasons to bet Carolina: The Hurricanes should be motivated to rebound from a 6-1 loss to the Rangers Wednesday night, snapping a 7-game streak in which Carolina had scored 3 goals or more. Toronto has scored 1 goal in 3 of its last 4 games. Reasons to bet LA: The Kings are 6-3 on the road and won 5 of their last 6 visits to Arizona. The Coyotes have scored 1 regulation time goal in each of their last 3 at home, where they are 1-7-1 on the year. Reasons to bet Arizona: The Coyotes have allowed just 6 goals in their last 3 games. LA has lost 6 of its last 7 games, scoring 2 goals or less in each of those defeats.